"Looking for current potitical news in USA? visit The Business Standard News to read breaking news of Potitical in USA." In case the “BS” in the logo wasn’t clear enough, the Business Standard News is a satirical fake news website. 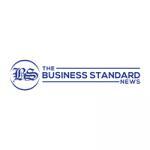 The Business Standard News is a satirical site designed to poke fun at the absurdity of the modern-day news cycle.